Krašići is a town in Montenegro, located on the Luštica peninsula, on the southern shore of the Bay of Tivat in the Boka Kotorska, between the places Franciskovići and Mitrovići. The Village church has a relief depicting the battle of Lepetane which was taken from the church in the old village. The village has one pier, with a navigational light, which encloses a small harbour; there is one more smaller harbour in the village. The beach is concrete beach with gravel sea floor. There are four bars on the beach, Zanzibar, Paradiso, Princ and Poseidon. Krašići was located at mountain side, a few kilometers from its present location. This place is now called Gornji Krašići (Upper Krašići) or Stari Krašići (Old Krašići) and current village is sometimes called Donji Krašići (Lower Krašići). The village graveyard is still located in the old village. Villagers lived mostly from planting olives and vines and producing olive oil and wine. 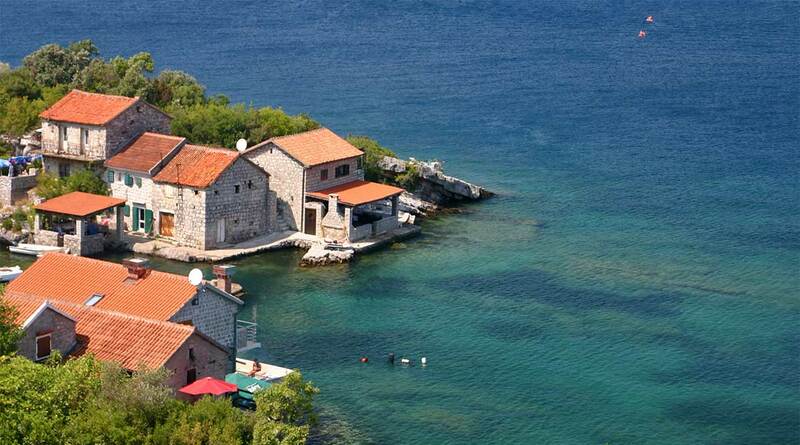 After the great 1979 Montenegro earthquake, the village was heavily damaged and people have resettled on the current location at sea shore, which was prior to the earthquake used for small-scale fishing. In addition to their former occupations, they increased fishing, and, recently, tourism. In the 1970s, some tourists started building houses around the village in larger numbers. This boomed and now they by far outnumber locals. The first tourist settlement is Krašići 1; after it, Krašići 2 was built. Tourists have also built the beach (which was a stony beach before that), streets and infrastructure in the settlement. Currently it has electricity, telephone and sewage, and random water supply. The only families which lived in the village were Francisković, Slavović and Petrović. It was the only Catholic village on Luštica though the families are celebrating slava. Original Krašići has some 15 houses; now, in addition to that, there are several small hotels held by locals. Nowadays with tourist settlements it has around 80 houses. Because the visitors in the 70s already decided to build holiday houses here, it is completely alive in the summer period when the residents go here. These can also be rented during the other periods that they do not stay there themselves. Larger hotel complexes can not be found and consists largely of apartments. Villa Mare Apartments – Villa Mare is set in a traditional stone house in the Tivat area, only 80 meters from the beach and promenade. It features an outdoor pool, a small fitness center and a Mediterranean à la carte restaurant. You can play table tennis. All rooms have a balcony with sea views, air conditioning, free Wi-Fi, a flat-screen TV and a fully equipped kitchenette. The private bathrooms include a hydromassage shower, a hairdryer and free toiletries. Guests can find a range of supermarkets, cafés and clubs within 100 meters. The complex is 10 km from the center of Tivat and 2.5 km from the popular Plavi Horizonti Beach. The well-known beaches of Mirišta, Rose and Žanjic are within 12 km from Villa Mare. Facilities : Terrace, Swimming pool, Balcony, Garden, Airport Shuttle (surcharge), Car Rental, Sea View, Private entrance.